This is Basic acoustics and Signal Processing for musicians and computer scientists. If you ever dreamed of making your own recordings or fiddling around with sound on your computer, then this article is just for you. This article intends to be educational. It hopes to provide the reader with a basic knowledge of sound and sound processing. Of course music is one of our concerns but all in all, it is just some noise among other less pleasant sounds. First the physical concepts of sound are presented together with the way the human ear interprets them. Next, signals will be looked at, i.e. what sound becomes when it is recorded especially with modern digital devices like samplers or computers. Last, up to date compressions techniques like mp3 or Ogg vorbis will be presented. The topics discussed in this paper should be understandable by a large audience. The author tried hard to use "normal terminology" and particularly terminology known to musicians. A few mathematical formulas pop up here and there within images, but do not matter here (phew! what a relief...). Physically speaking, sound is the mechanical vibration of any gaseous, liquid or solid medium. The elastic property of the medium allows sound to propagate from the source as waves, exactly like circles made by a stone dropped in a lake. Every time an object vibrates, a small proportion of its energy is lost in the surroundings as sound. Let us say it right now, sound does not propagate in a vacuum. Figure 1a shows how a stylus connected to a vibrating source, like a speaker for example, converts to a wave when a band of paper moves under it. As far as air is concerned, sound propagates as a pressure variation. 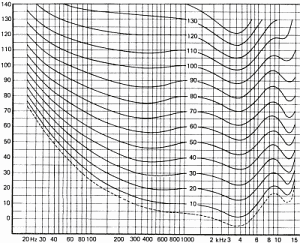 A loudspeaker transmits pressure variations to the air around it. The compression (weak) propagates through the air. Please note that only the pressure front moves, not the air. For the circles in water mentioned earlier, waves do move whereas water stays in the same place. A floating object only moves up and down. This is why there is no "wind" in front of the loudspeaker. Sound waves propagate at about 344 meters per second, in air at 20°C, but air particles only move a few microns back and forth. We know now, from the above drawings, that sound waves have a sine shape. Distance between two crests is called wavelength and the number of crests an observer sees in one second is called frequency. This term used in physics is nothing but the pitch of a sound for a musician. Low frequencies yield bass tones whereas high frequencies yield high pitched tones. The average amplitude is only a theoretical measure and technically not used. On the other hand, the root mean square value is universally adopted to measure equivalent signals and especially sine waves. For instance, the equivalent current available on one of your home plugs is rated 220 volts sinusoidal varying at a constant frequency of 50 Hz. Here the 220 volts are RMS volts so that the voltage is really oscillating between -311 volts and +311 volts. Using the other definitions, this signal is 311 volts peak or 622 Volts peak to peak. The same definitions apply for the output of power amplifiers, fed to speakers. An amplifier able to yield 10 watts RMS will have a peak value of 14 watts and a peak to peak value of 28 watts. These peak to peak measurements of sine waves are called musical watts by audio-video retailers because the figures are good selling arguments. As it does with music, time plays a fundamental role with acoustics. A very close relationship binds time to space because sound is a wave that propagates into space over time. Random : Signals not being periodic. In the following, we will deal with a restricted class of these signals; those having stable statistic properties over time. They are called random ergodic signals. This is the case for noises like white or pink noise used by scientists or some musicians. Pulse: Signals not repeating over time but with a defined shape. 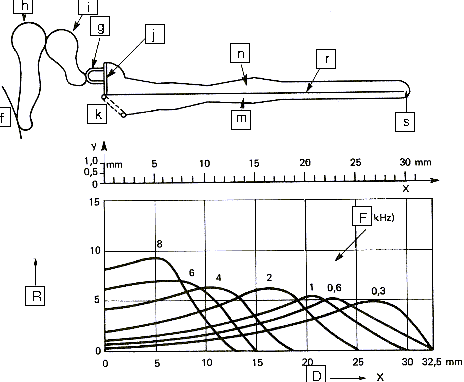 The diagrams of figure 6 show some sound signals. We take advantage of these diagrams to introduce the notion of spectrum. The spectrum of a signal shows the different "notes" or pure sounds that make a complex sound. If we take a stable periodic signal like a siren or a whistle, the spectrum is stable over time and only shows one value (one line on figure 6a). This is because it is possible to consider each sound as the combination of pure sounds which are sine waves. We shall see later on that this decomposition of periodic signals into sine waves has been demonstrated by a French mathematician named Fourier in the 19th century. This will also allow us to talk about chords as far as music is concerned. Meanwhile, I shall stick to sine waves because it is a lot easier to draw than solos from Jimmy Hendrix. 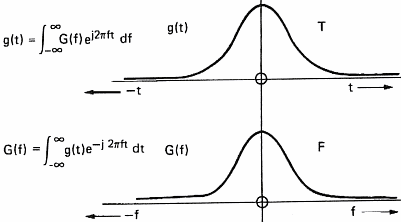 Figure 7d: Discrete Fourier Transform. This demonstrates (please believe me) that the transformation of a continuous wave into a series of discrete points makes the spectrum periodic. If the signal is also periodic, then the spectrum is also discrete (a series of points) and we only need to compute it at a finite number of frequencies. This is a good news because our computer can only compute numbers and not waves. So we are now faced with the case of fig. 7d where a sound signal and its spectrum are both known as a series of points which where the fluctuate over time and in the frequency domain between 0 Hz and half the sampling frequency. Above: Sampling frequency equal to max. freq. and a DC signal as seen by the sampler. This particular behavior of sampled signals is best known as the Shannon theorem. Shannon is the mathematician who has demonstrated this phenomenon. A similar effect can be observed on the cart wheels in films, e.g westerns. They often appear to run backward because of the stroboscopic effect of films. For daily use of sound acquisition, this means that you need to eliminate all frequencies above half the sampling frequency. Not doing so will mangle the original sound with spurious sounds. Take for instance the sampling frequency of compact discs (44.1 KHz); sounds above 22 KHz must be absent (tell your bats to keep quite because they chat with ultra sounds). Figure 9: Practical vs ideal filter. A filter is a device that changes the signal both the time and spectrum of the sound wave. A 100 Hz square wave low pass filtered at 200 Hz will become a sine wave because the upper part of its spectrum is removed (see figure 6c). Similarly, a note at 1000 Hz played by a piano (C 6) will sound like a whistle if it is filtered at 1200 or 1500 Hz. The lower frequency of the signal is called fundamental frequency. The others are multiples and are called harmonic frequencies. In the time domain, a filter introduces modifications of the wave called distortions. This is mainly because of the delay taken by each harmonic relatively to the others. In order to show the influence of a filter on a signal, let us consider a simple square pulse (figure 10a),the amplitude of its spectrum (figure 10b) and the phase of its spectrum (figure 10c). This square pulse acts as a filter allowing sound to go through between t=0 and T seconds. The spectrum of the pulse represents the frequency response of the filter. We see that the higher the frequency of the signal, the bigger is the delay between the frequency components and the lower is their amplitude. Figure 10a: Time signal. Rectangular pulse at t=0. 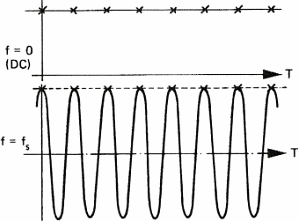 Figure 11 represents the influence of the rectangular filter on a simple signal like a sine wave. 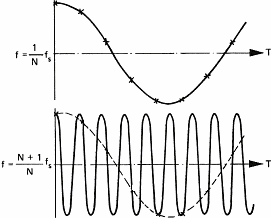 Cutting sound abruptly at time T introduces new frequencies in the spectrum of the sine wave. If the filtered signal is more complex, like the square wave of figure 6c, the frequency components will lag giving a distorted signal on the output of the filter. For a better understanding of acoustics and sound, let us focus on the part we use to receive sound: the ear. 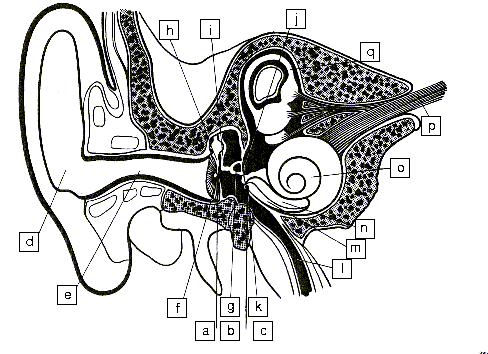 Figure 12 shows a cross section of the ear. Sound is collected in the pinna and channeled through the auditory canal toward the ear drum which acts more or less like a microphone. The vibrations of the ear drum are amplified by three small bones acting like levers and named the hammer, the anvil and the stirrup. The movements of the stirrup are transmitted via the oval window to the cochlea. The cochlea contains two chambers separated by the basilar membrane which is covered with sensitive hair cells linked to the auditory nerve (As shown on figure 13 and 14 below). The basilar membrane acts as spatial filter because the various parts of the cochlea are sensitive to the various frequencies thus allowing the brain to differentiate the pitch of notes. The brain plays a very important role because it does all the analysis work in order to recognize sounds, according to pitch of course, but also according to duration. The brain also performs the correlation between both ears in order to locate sound in space. It allows us to recognize a particular instrument or person and to locate them in space. It seems that most of the work done by the brain is learned. 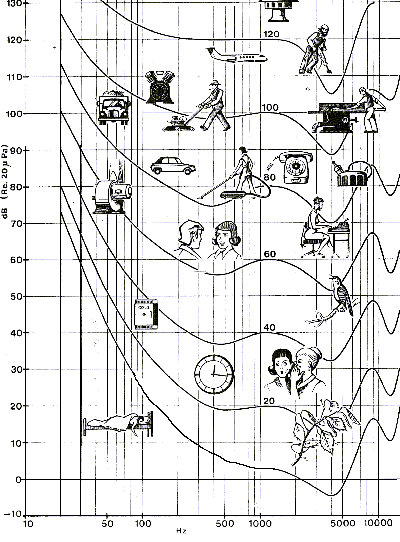 Figure 15 shows how we hear sounds according to frequencies. experience: being a musician or not for example. 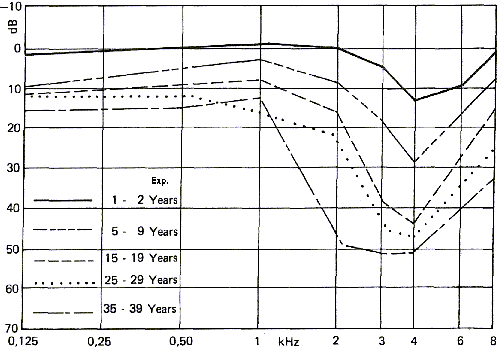 Figure 16 shows the influence of age on hearing loss for different frequencies. According to the sources the results are different. This is explained easily by the large variations that can be observed in a population and because these studies cannot easily take only age into account. It is not rare to find aged musicians with young ears as well as there are young people with important hearing loss due to long exposure to strong noises like those found in concerts or night clubs. Noise induced hearing loss depends both on the duration of exposure and on the noise intensity. Note that all sounds are considered here as "noise" and not only the unpleasant ones. Thus, listening to loud music with headphones has the same effect on the auditive cells as listening to planes taking off on the end of the runway. Figure 17 shows the effect of exposure to noise on hearing. Notice that the effects are not the same as those induced by age where the ear loses sensitivity at high frequencies. On the other hand, noise induced hearing loss makes the ear less sensitive around 3-4 Khz. At those frequencies, the ear is the most sensitive. This kind of hearing loss is usually seen among firearms users. If you take a look at the chapter about decibels and their calculation, you will notice that about ten decibels corresponds to a very large acoustic pressure change. Having a linear decibel scale is equivalent to an exponential pressure scale. This is because the ear and the brain are able to handle very large variation of both amplitude and frequency. The highest frequency sound the healthy human can ear is 1000 times the frequency the lowest, and the loudest can have a sound pressure one billion times that of the quietest that can be heard (an intensity ratio of 1012 to 1). Doubling pressure only represents 3 dB. This can be heard but an increase of 9 dB of the sound intensity is needed for the human being to have a subjective feeling of double volume. This is an acoustic pressure 8 times stronger! In the frequency domain, changing octave is equivalent to doubling the sound frequency. Here too, we hear linearly the exponential increase of a physical phenomenon. Do not rush to your calculator yet, calculating the pitches of notes will be done later on. A symphonic orchestra can play sounds ranging up to 110 dB. This is why disc editors use dynamic compression systems so that louder sounds are not clipped and quieter ones not lost into noise. In addition to being less capable than the human ear, recording devices also have the drawback of generating their own noise. It can be the rubbing of the diamond on the vinyl disc or the snoring of the amplifier. This kind of noise is usually very low but do not allow for quietest sounds to be recorded. It is best heard most of the time with good quality headphones and sounds like a waterfall because it has a very wide spectrum including many frequencies. We saw earlier that filters have an important effect on the phase of a spectrum because they shift signals according to their frequency. This type of signal distortion is called harmonic distortion because it affects the harmonic frequencies of the signal. Every single device recording a signal behaves like a filter and thus induces signal distortions. Of course, the same happens when you play any recorded sound again. Additional distortion and noise will be added. More and more, compression algorithms like mp3 or Ogg Vorbis are used to gain precious disk space on our recording media. These algorithms are said to be destructive because they do eliminate part of the signal in order to minimize space. Compression programs use a computer model of the human ear in order to eliminate the inaudible information. For instance, if two frequency components are close to each other, the quietest can be safely taken off because it will be masked by the louder one. This is why tests and advice can be found on the Internet in order to best use this software, i.e. keep the best part of the signal. According to those read by the author, most mp3 compressions do low pass filter sounds at 16 KHz and do not allow for bit rates higher than 128 KiloBits/seconds. These figures are most of the time unable to maintain sound at CD quality. On the other hand, compression software like gzip, bzip2, lha or zip do not alter data but have lower compression ratios. Moreover, it is necessary to uncompress the whole file before listening to it, which is not what is needed for a walkman or any other sound playing device. In order to settle things, here is a comparison of terms used by music and science. Most of the time, these comparisons have limits because the terms used by music lovers describe human hearing and not physical phenomenons. Assuming notes are frequencies is far from being enough to distinguish a note played by one instrument from another one.. One also needs to take into account how the note is played (pizzicato or legato), from which instrument it comes, not counting all possible effects like glissando, vibrato, etc... For this purpose, notes can be studied using their sonogram which is their spectrum across time. 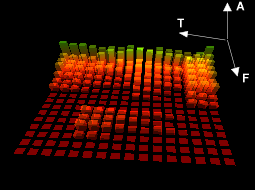 A sonogram allows all the harmonic frequencies to be viewed along time. Nowadays, electronic sound recording and playing uses totally artificial devices like synthesizers for creating sounds out of nothing or samplers to store sound and play it at different pitches with various effects. It is then possible to play a cello concerto replacing the instruments with sampled creaking of chairs. Every body can do it, no need to be able to play any instrument. The curve shows the evolution of the global loudness of sound along time. 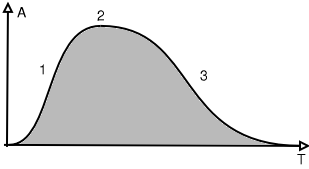 This type of curve is called an envelop because it does envelop the signal (grey part of the drawing). The rising part is called the attack and can differ tremendously according to the type of instrument. The second part is called sustain and is the body of the note and is often the longest part except for percussion instruments. The third part can also change shape and length according to the instrument. Moreover, instruments allow musicians to influence each of the three parts. Hitting differently the keys of a piano will change the attack of the note whereas the pedals will change the decay. Each of the three parts can have its individual spectrum (color) which make the sound diversity infinite. Harmonic frequencies do not change at the same rate. Bass frequencies tend to last longer so that the color of the sound is not the same at the beginning and at the end of the note. According to its definition, the frequency range of a device can be associated to the range of an instrument. In both cases the terms describe a range of frequencies or pitches an instrument can play. However, the highest pitch an instrument can play is equivalent to the fundamental frequency given in the array above. In other words, recording a given instrument requires a device having a frequency range much higher to the highest note the instrument can play if the color of the notes are to be recorded. A short frequency range will low pass filter all the upper harmonics of the higher pitch notes and this will change sonority. In practice, a device with the frequency range of the human ear, i.e. 20hz to 20Khz, is needed. 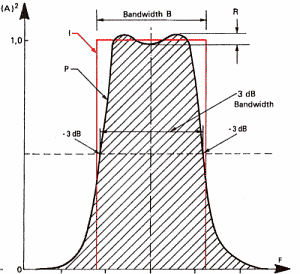 Often it is necessary to go higher than 20 Khz, because devices introduce distortion well before the cut off frequency. Analysing the frequency array of notes above, musicians will find similarities between harmonic frequencies and notes making a chord. Here we see why a chord is known as perfect (C-E-G-C) or seventh (C-E-G-Bb): The frequencies of the notes within the chord are aligned with the harmonic frequencies of the base note (C). This is where the magic is. Without much going into the details, we have looked at the physical, human and technical aspects of sound and acoustics. This being said, your ear is will always be the best choice criterion. Figures given by mathematics or sophisticated measuring devices can help you understand why one particular record sounds weird but they will never tell you if the Beatles made better music than the Rolling Stones in the sixties. Brüel & Kjaer: Danish company making measurement instruments for acoustics and vibrations. This company has published for a long time (fifty years or so) free books where most of the drawings for this article come from. These books are available on line in PDF format under the following http://www.bksv.com/bksv/2148.htm link.